Free Download Education from SoftAK.com - Puzzles,Arcades,Logic games,Cards and much more free,shareware,demo games. Offers addictive new set of multi-player games with largest progressive jackpot ever offered online. You will enjoy our instant bonuses (as 100% bonus on 1st deposit up to $200), weekly and daily promotions, free and fast payouts. BeTheWinner already serves thousands of players every day. Join with them, don't hesitate and try your luck! Create and print timetables for school and other activities! Simply select number of days, enter your times and subjects, select design, colors and fonts, save for later reuse and printout as many copies as you like. Ready! ABC Timetable is Freeware! Are you learning Spanish? Working on expanding your Spanish vocabulary? If so, 600 Spanish can help! - Learning is accomplished by answering multiple-choice questions. - Comes with over 600 useful Spanish words and phrases. - The topics include Basic Phrases, Business, Time, Entertainment and more. - Adjusts to your way of learning to make it more efficient and fun. - Free trial. TypeBlaster is an educational video game that improves typing speed It makes it fun for people of all ages to quickly and accurately improve their typing skills and keyboard recognition. It uses the latest 3D video game technology and runs on windows 2000 and XP with a current video card. The challenge is to get the highest typing speed before time runs out. You can select 1, 3 or 5 minute sessions. COLOREA is a child-orientated, completely non-violent computer programme for little artists. More than 100 different painting patterns can be imaginatively designed over and over again. Subjects in many different stylistic ways see to it that kids work creatively with colour, forms and the computer for hours. 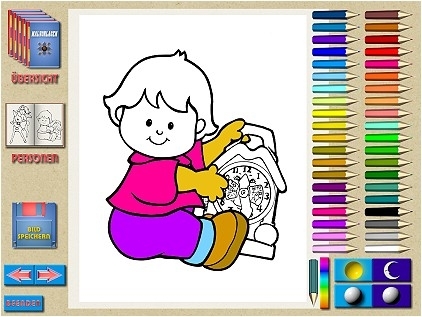 All the produced compositions of the little artists can be stored and printed. So you’ll have nice memories of your child’s early years. Join The Biggest Backgammon Club on The Net. Play For Free And Meet New People From All Around The World. Playing Backgammon is Exactly The Same as in Real Life, Only You Get to Meet Exciting People From All Over The World and Play Against Them. My Little Memory Game is a simple free memory game with 3 levels. For ages 4-10. To learn the multiplication table!? There is nothing easier! Not only it is simple, but also is fast! Try just now and make happy your teachers!!! Eight levels with colourful graphic interface and pleasant music.The principle of a choice of the correct answer among available ones is used, that together with perception of graphic images promotes the accelerated training. Slots_Ahoy is a 243 Payline X 5 Reel Slot with a Blue water theme. Less than 243 Lines can be played if desired with some of the symbols being hatched out. A total of 500 coins can be played for each spin.With 243 PayLines there are naturally a lot of pays. There is a wildcard on reels 2,3,and 4 which will sometimes double, triple or quadruple the pay,a freespin feature is triggered with 3 or more Lighthouses . MatheMax is an entertaining and varied program for practicing basic arithmetic operations. The calculation method is preselectable, including simple counting exercises, addition with symbols, addition/subtraction with different number ranges, and multiplication/division with defined factors as well as mixed mode. One can thus train various learning skills. Optional logfile for tracking learning results. A solution button shows the correct result. MaTris is a nice program for practicing the basic operations of arithmetic. The calculation method is preselectable. It includes simple counting exercises, addition with symbols, addition/subtraction with different number ranges, and multiplication/division with defined factors. One can thus train different learning skills. After solution the kids may play a Tetris like game. Play classic multiplayer casino games such as Blackjack, Roulette, Baccarat, Spice Island Poker and Let-It-Ride Poker. These games enhance the online casino experience, allowing you to sit and chat at the same table with other players from around the globe. Players may test Peach casino for free, as long as they wish before playing for real money. Special bonuses are offered too. Not many card games require a save game feature, but then not many card games are like Bergman. The game starts simple enough, you and the computer each have five cards and all you have to do is be the first player to have zero cards. A lucky few may manage to quickly discard those five cards, but more than likely the the card count will grow and the challenge that is Bergman will begin! Slots_GoWest is a 243 Payline X 5 Reel Slot with a western theme.. A total of 500 coins can be played for each spin if desired.There is a wild card which if used will double,triple or even quadruple some pays. A freespin feature is included. With 243 PayLines there are naturally a lot of pays. Full screen is available if desired.